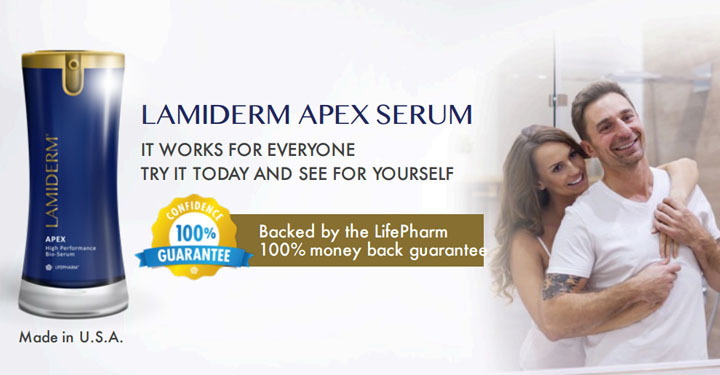 Lamiderm APEX Skin Serum is the first skin care of its kind that has LOX Enzyme activator. LOX Enzyme works at deep cellular level and is responsble for having supple skin fibers. The activator contains FGF that can regenerate skin cells with no chemical side effects. There is no other skin care product with a naturally-occurring LOX Enzyme Activator. There are only two ways to know if a product works. Through varied testimony and clinical tests. LifePharm Research scientist, Edward Andujar conducted a digital skin care analysis on Lamiderm® Apex participants. The participant applied the serum directly to the face. Using a digital skin tester, the Collagen units before the application is 25, after a few minutes it went up to a high of 40 units of collagen. Likewise, the elasticity units before the application were 19 unit, after applying Lamiderm, it increased to 42 units. Other tests done showed it lighten skin by 15% in 12 weeks, reduced dark spots by 54% in 12 weeks. Developed with the Fertilized Avian Egg Extract, Lamiderm supports the body’s production of Lysyl Oxidase (LOX) in the skin. It helps supplement the body’s LOX production for improved collagen, elastin and fibronectin at the cellular level. 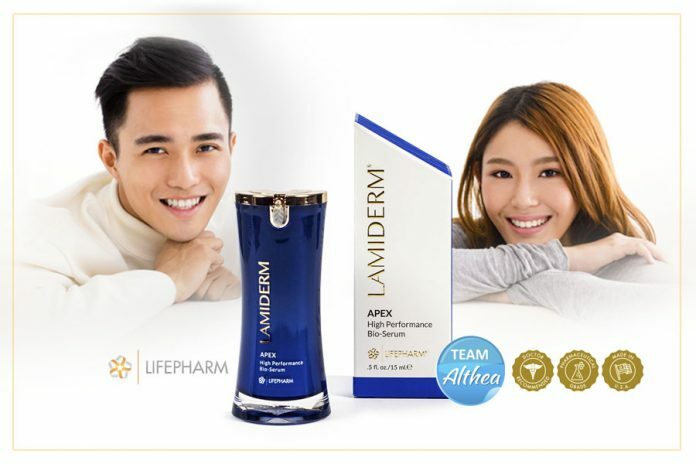 * Lamiderm Apex is the first known source of LOX in a skincare product. LOX (Lysyl Oxidase) is the main ingredient of Lamiderm. It is a natural enzyme that naturally occurs in human skin. This substance is also found in Laminine Food Supplement. LOX is rich in protein nutrients that lengthens the skin fibers – Lysyl Oxidase. At a much younger age, this enzyme is bountiful in the skin but as we age, it diminishes. LOX helps link small collagen fibers to longer, stronger fibers, giving that youthful skin. Lamiderm also contains Growth factors: PDGF and TGF1-ß that stimulate collagen, elastin and fibronectin fibers in human skin cells. The FibroBlast Growth Factor applied in Lamiderm boosts the production of elastin and collagen by up to 250 percent. Although the body can naturally produce LOX, it dissipates as we age. Taking both Lamiderm and Laminine encourages healthy skin cells from the inside. This is one of the most superior brightening ingredients available. Made from seven Swiss Alpine plants, it’s been scientifically proven to gently brighten the complexion by enhancing cell health while restoring skin to a natural glow. A blend of Vitamin C, Vitamin E, and CoQ10 strengthen cells against photo-aging and enhance overall skin health. This blend restores skin’s texture through five fruit extracts that stimulate cell vitality and resist damage from pollution and UV radiation. Other natural ingredients were used for a safe and effective delivery system such as Aloe Vera juice, sunflower seed oil, and coconut oil to create a plant-based system that allows the serum to penetrate beneath the skin’s surface without irritation. Buy Lamiderm from authorized distributors only. Choose Althea Group.